I am privileged to be mentioned in this highly regarded Newsletter. 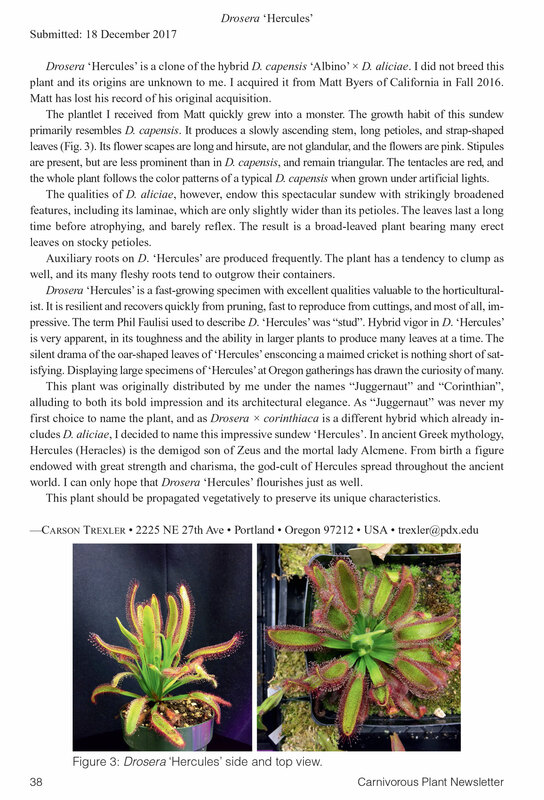 Although most new CP cultivars are usually scarce, the recently registered Drosera cultivar is all it's cracked up to be, and it is now available for purchase. Read the following article to learn more. Special thanks to Carson Trexler and the ICPS for allowing me to display the following on my website. Drosera ‘Hercules’ is a clone of the hybrid D. capensis ‘Albino’ × D. aliciae. I did not breed this plant and its origins are unknown to me. I acquired it from Matt Byers of California in Fall 2016. Matt has lost his record of his original acquisition. The plantlet I received from Matt quickly grew into a monster. The growth habit of this sundew primarily resembles D. capensis. It produces a slowly ascending stem, long petioles, and strap-shaped leaves (Fig. 3). Its flower scapes are long and hirsute, are not glandular, and the flowers are pink. Stipules are present, but are less prominent than in D. capensis, and remain triangular. 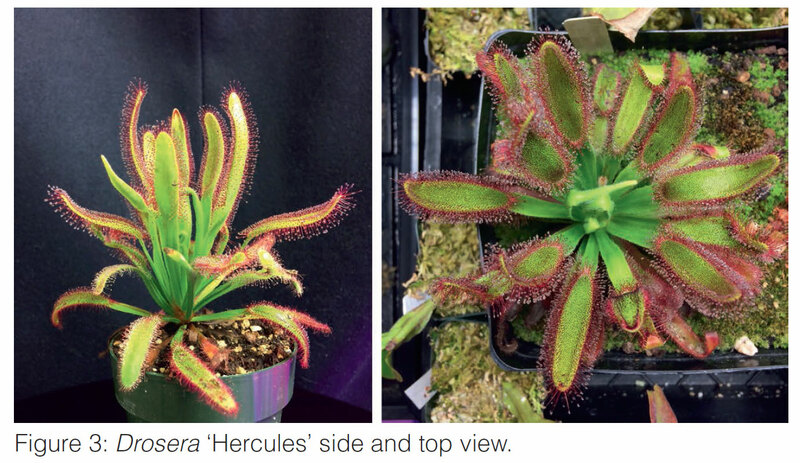 The tentacles are red, and the whole plant follows the color patterns of a typical D. capensis when grown under artificial lights. The qualities of D. aliciae, however, endow this spectacular sundew with strikingly broadened features, including its laminae, which are only slightly wider than its petioles. The leaves last a long time before atrophying, and barely reflex. The result is a broad-leaved plant bearing many erect leaves on stocky petioles. Auxiliary roots on D. ‘Hercules’ are produced frequently. The plant has a tendency to clump as well, and its many fleshy roots tend to outgrow their containers. Drosera ‘Hercules’ is a fast-growing specimen with excellent qualities valuable to the horticulturalist. It is resilient and recovers quickly from pruning, fast to reproduce from cuttings, and most of all, impressive. The term Phil Faulisi used to describe D. ‘Hercules’ was “stud”. Hybrid vigor in D. ‘Hercules’ is very apparent, in its toughness and the ability in larger plants to produce many leaves at a time. The silent drama of the oar-shaped leaves of ‘Hercules’ ensconcing a maimed cricket is nothing short of satisfying. Displaying large specimens of ‘Hercules’ at Oregon gatherings has drawn the curiosity of many. This plant was originally distributed by me under the names “Juggernaut” and “Corinthian”, alluding to both its bold impression and its architectural elegance. As “Juggernaut” was never my first choice to name the plant, and as Drosera × corinthiaca is a different hybrid which already includes D. aliciae, I decided to name this impressive sundew ‘Hercules’. In ancient Greek mythology, Hercules (Heracles) is the demigod son of Zeus and the mortal lady Alcmene. From birth a figure endowed with great strength and charisma, the god-cult of Hercules spread throughout the ancient world. I can only hope that Drosera ‘Hercules’ flourishes just as well. This plant should be propagated vegetatively to preserve its unique characteristics.